When you walk around Cuba, you will notice that American cars from the 1940’s and 1950’s comprise the major chunk of their transportation system. 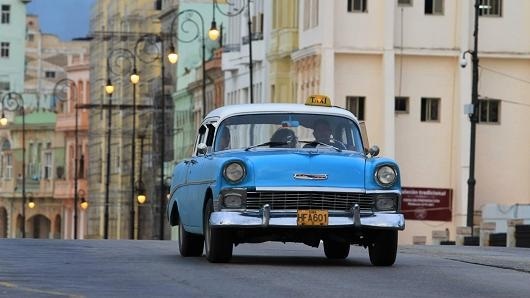 The classic Chevrolet Impala or the 1957 Chevy Bel Air, two dream cars of many around the world, can be found almost anywhere in the streets of Havana in the form the city’s urban transit. While the picture seems bright on the outside, there is an uglier truth behind the fascinating story of vintage cars in Cuba. On October 19, 1960 the United States imposed a trade embargo in Cuba. This meant that American companies were not allowed to do any business in the island nation. The final nail in the coffin came when Fidel Castro didn’t permit Cubans to buy cars during the same time. They could only be given to them by the government and the people already on the island were the only ones who could trade cars amongst themselves. The result is there to see. A collector’s favourite ‘57 Chevy’ with the interiors intact including the rocket like hood ornaments was recently sold to Luis Abel Bango who spent seven years searching for his dream car. He found it on Cuba’s far western tip, buying it from the owner for $7,000. “I went everywhere looking for what I wanted. Out in the provinces, central Cuba. I had to go to the end of the island to find this one,” Bango says. Bango might have found his collector’s item, but finding a car in such a good shape is a huge challenge. For every diamond in the lot, there are a majority of them which have been stripped of their original parts. Sheets of plastic turn into convertible roofs and diesel engines replace the original as they are cheaper to run. The pothole-filled roads also have had a significant impact on the quality of these otherwise excellent cars. You would probably find a Mitsubishi diesel engine installed in a ‘57Chevy’. “What you see are a lot of cars that are just kind of rolling hulks held together with duct tape and chicken wire,” says Lance Lambert, host of U.S. television show Vintage Vehicles. Chevy’s are the most common, but you can also find Fords, Buicks, DeSotos, Plymouths and Oldsmobiles as well. If you’re lucky you might spot a Cadillac hustling around. Luis Abel Bango’s long search got him his dream car, and if you’re one of those who always wanted a classic to ride on, you know exactly where to head on your next holiday.